From Haines I took the Alaska Marine Highway to Bellingham, stopping two and half days in Juneau and a half day in Ketchikan. 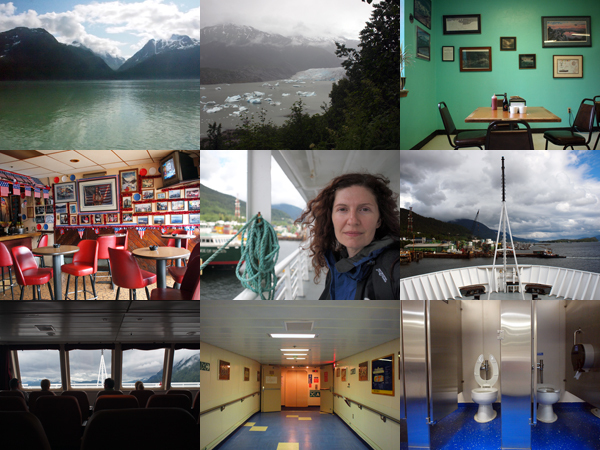 Stowed the car and control and let focus turn inward, first while sitting and watching the glacier-packed peaks of the Tongass drift by on an elfin-lit day and later writing and reading and sleeping on the three-day journey home. I could have driven forever, across all of Canada or every road of the Yukon and Alaska. You know that by now. But truth is, I was exhausted. And, anyway, what dream is that to go forever, unbound? The dream of the drifter. How's that end? Well, I'm broke too. So there's that. Though there is always more money to be made. Riding the ferry has been much more fun than I thought it would be. It's a low-key ride with mediocre food, but the showers and bathrooms are clean and the crew are friendly, like you're the only passengers they've ever had. I had a two-berth cabin I could retreat to. The rest of the time I sat in the forward lounge with this computer, among couples of all ages playing cards and board games or reading books, all watching for whales or porpoises or the ever-shifting proportion of cloud and sky. Now I think I could sail for a long time, safely stowed in this vessel. I'd ride out the rough seas in my bunk, asleep or letting the bucking sea flow into my mind. Juneau might have been too small a town to stay in for two full days, but I filled the time. I couldn't sit still, and then I could and then I couldn't make myself go. So I slept and read a lot in the little inn where I was staying, putting out the Do Not Disturb for the duration, even when I went out. And when I went out, I went for long walks around the old town and the wharf. I ran around Auke Lake, my body heavy from widening a cup that won't fill. I hiked up the hills beside Mendenhall Glacier in a cold rain. I drove every road to its end too, just to take again from the source. Like so, I mapped it. The inn was a renovated building downtown set up like a European-style pension. It had a big common area with free snacks and drinks and quirky little amenities with cute explanatory notes. I had a room that looked at a wall, which was contemplatively antithetical to the rest of the travel so far, but I enjoyed the mystery of the interstice between the window and the wall, and of the strange sounds that reverberated through the old structure. I've been on a quest for good halibut and chips, and the dive bar in Juneau wins. I'd had a disappointing round downtown so I spent some time scouring the web. An entry on a forum for float plane pilots mentioned the place, said not to let the looks of it fool you. Located in an industrial area, the neon beer signs were the only indication the building might not be a warehouse. I was nervous to enter, being an obvious visitor and not being able to see from the outside what kind of scene I was about to join. But I went in anyway. Bearded, hatted heads previously tuned to the television above the bar turned to see what was coming in. It was black dark in there except for the television and the small bulbs on various machines. A waitress approached before I could reach the bar. I asked about the fish and chips and she directed me to another room in back that was brightly florescent and empty except for one local family. Not a cruise ship passenger in sight. Juneau and Ketchikan are inundated with cruise ships and the people who ride them. Five or six ships at a time that dwarf the cities. You can tell the passengers by their bleached blonde hair, city coats, and Ugg boots. By their sense of entitlement, too. They dress in the garb sold in those boutiques that pock every tourist destination. Pastels and velvet, frilly collars. Windbreakers and fleece with names of places on them. I learned, because I saw it happen, that the cruise ships arrive at night and spill by day. By eight or nine in the evening, the passengers recede. The town sighs in the quiet and residents emerge from secret pockets to stand brazenly again in the empty streets.